Scribbles from a midnight diary: HAPPY BIRTHDAY DUSTY! 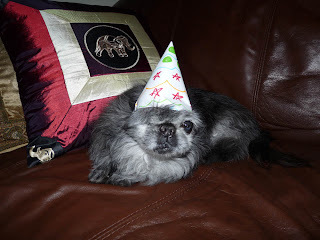 Dusty, my one eyed Pekingese, turned a whopping 16 years old today! Every day should be a cause for a celebration! Dusty is the toughest dog I know. He can puke one moment and then want food the next. He can fall down a flight of stairs and get up and shake it off. He has survived big dog attacks, small dog attacks and has outlived two of his other brothers. At 15 1/2 years of age, he crossed the entire United States twice by car (he wasn't the one driving but still) and flew up to Canada. He took every new experience in stride. I hope that when I'm 110 years of age, I have enough energy to get out of bed. 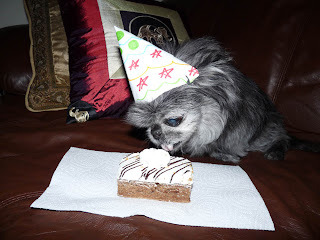 To celebrate, Dusty enjoyed his birthday cake courtesy of Three Dog Bakery. It is well deserved, my friend. Dusty says "Screw the Rainbow Bridge, I'm gonna stay down here for a while longer". And for that, I am very thankful. Dr. Phil in the O.C.